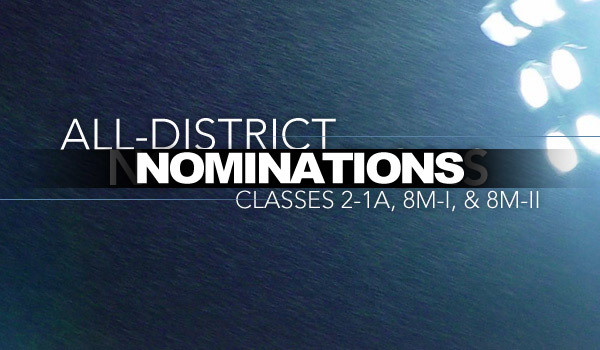 Kpreps.com is in the process of obtaining nominations for our sixth annual All-District teams for Class 2-1A and Eight-Man Divisions I and II. With the expansion of districts in the smaller classes many of the traditional league schedules have been reduced or eliminated altogether. As a result, leagues are finding it more and more difficult to name league champions and award all-league honors. Beginning in 2010, Kpreps.com began naming an All-District Team for each of the eight districts in these small classes. To view past All-District teams, visit our History section and search by class. We would like to ask Coaches and ADs for help in allowing us to recognize the deserving players within your district by nominating them for All-District honors. We have sent out All-District forms to all coaches for who we have contact information for. CLICK HERE for the online forms or to download the form documents (Microsoft Word). Please email completed forms to alldistrict@kpreps.com. The deadline for nomination forms is Monday, December 7th. Also, we ask that you provide your input for the Kpreps All-State teams. Recommendations can be sent to allstate@kpreps.com.